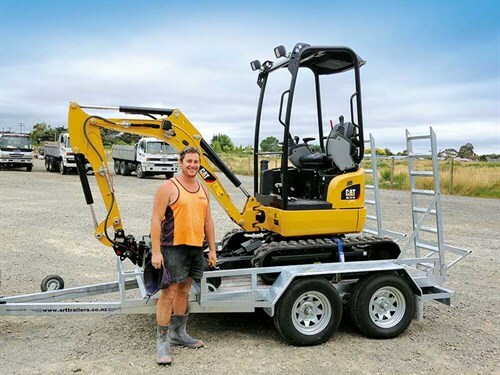 Three new Cat mini excavators are proving to be a triple threat for Marton-based Andrew Morriss Concrete & Works, and mean a greater level of productivity for the business both on and off the job site. 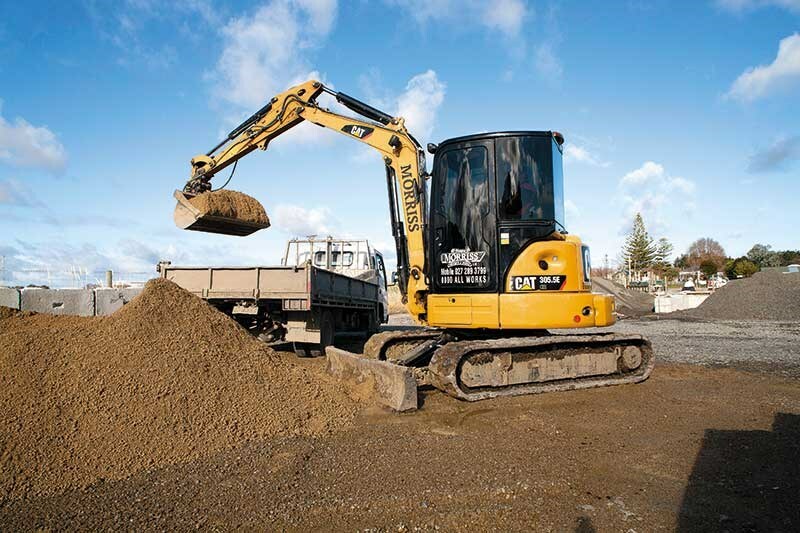 Andrew Morriss Concrete & Works has purchased a range of Cat compact equipment from Gough Cat in recent years, including new Cat 301.7DCR, 302.7DCR and 305.5ECR mini excavators which are all playing a key role in the recent expansion of the operation over the last 18 months. For a company that is presently thriving on ‘growth’, the addition of these three Cat machines plays a central role in stimulating that growth and increasing the business’ levels of productivity, while receiving only positive feedback from within the ranks. Contractor Andrew Morriss purchased his first Cat machine back in 2004 and his trusty 304CR is still working hard within his operation. However times have changed greatly since then when Morriss hired gear to work in his business. Morriss takes up the story, "I’d had enough of hiring gear from other brands that kept breaking down and giving me reliability problems. If I was being serious about making a go of it, I reckoned it was time to buy my own machine, and after careful consideration I decided on a Cat 4 tonner [excavator] from Goughs. It was a big investment for a 24 year old back then, but that purchase has paid off in spades." 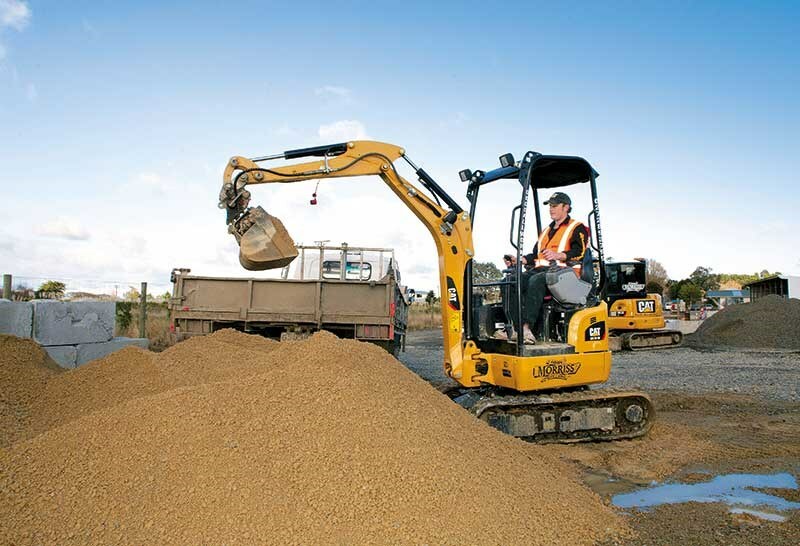 Operating throughout the Rangitikei region but working as far north as Okakune and south to Waikanae, the company specialises in concrete, driveways, and general earthworks, and also subcontracts to Rangitikei District Council, Higgins, and Downer. While keeping the company busy, these key relationships with other businesses have also developed opportunities to do additional private work and Morriss has since expanded into road and farm contracting including drainage and culvert work. As the amount of work has grown, it has allowed the contractor to expand his fleet. It now includes six trucks and seven diggers, with the three new Cat mini excavators being acquired since the start of 2014. The operation has also just added a low hour Cat 906 loader and 311CU excavator from Goughs. Morriss’s most recent new purchase is a 1.7-tonne Cat 301.7DCR mini excavator, and in the few months it’s been in his fleet, the unit has certainly impressed. "It’s a mighty machine – for the compact size of it, it’s amazing what it can do. With its tilt bucket and powerful slew, I find it can do the work of a heavier excavator. Our operators love it and we haven’t looked back." The machine’s ability to cope with an intense workload stems from the engine which has the largest output of any excavator in its class, producing 24 horsepower. Also, the efficient design of the hydraulic system reduces fuel burn of the machine and ultimately improves its multi-functioning capability. Gough Cat territory manager Carl Southee says the 301.7DCR outperforms the competition in many key specifications. "The 301.7DCR is the most highly equipped excavator in its class, and the feedback I continually get from customers is that the multi-functional capability of it is superior to others. 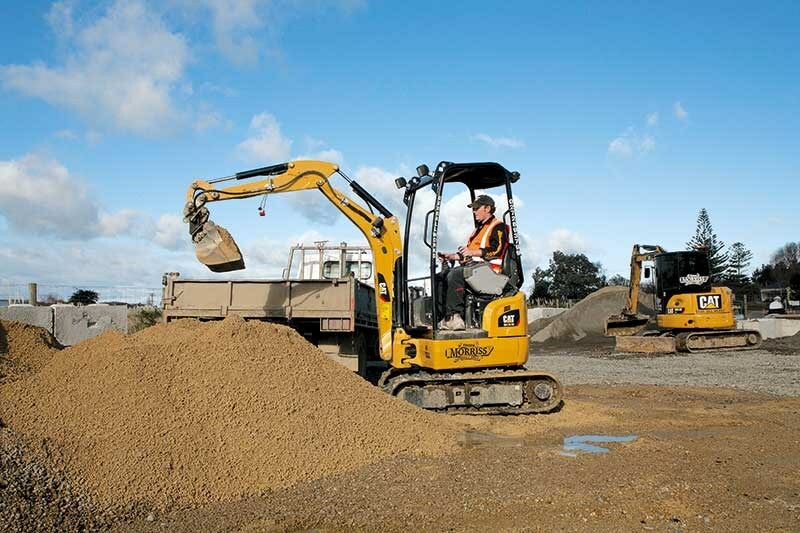 "Most of the competitive machines in its class aren’t capable of more than two tasks at a time, and the Cat 301.7DCR can operate the boom, stick, slew and tracks simultaneously," says Southee. "Given that it is a compact radius machine with zero tail-swing, and that class of machine is where the big growth in the market is, we are definitely seeing a growing interest in this type of machine over a conventional counterweight one." Morriss has become a great advocate for Cat products, not only for the performance of his machines but how they improve his business for the long term. "With eight Cat machines in total, our company has invested a lot into the brand, and the effort Carl has gone to accommodate us in these deals is tremendous," says Morriss. Of his three recent Cat mini excavator purchases, the 302.7DCR is Morriss’s favourite. "Like the 301.7DCR, this Cat has awesome breakout force for its compact size. It works with a lot of hard materials and I find it’s more powerful than my older four tonne 304. The tilt bucket is fantastic, I wouldn’t be without it." "The 305.5ECR now has about 900 hours on it, but it still feels like a brand new machine. It’s a six-tonner and we use it for a lot of our footpath works and our operators find that it’s so responsive. It’s an operator’s dream with everything on your controls and the computer control panel right there." Morriss is referring to the COMPASS control panel in the cab. 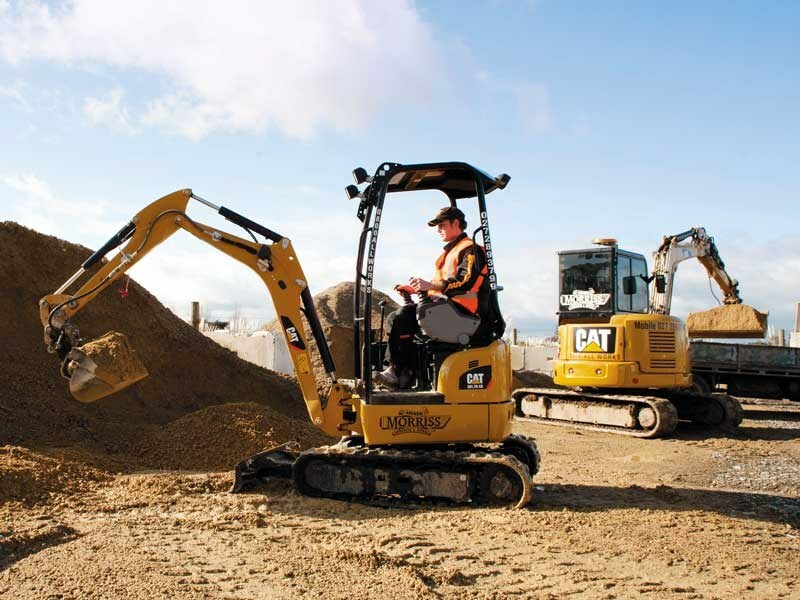 Now standard on all models, and designed by Caterpillar specifically for Cat Mini Excavators, this integrated system gives the operator the convenience of all performance, maintenance and operating functions right at their fingertips. Under the direction of Morriss, his staff numbers are going from strength to strength. There is now an accomplished team of 13 people and business opportunities are surfacing throughout the region. "The Cat machines are vital to our core business and I want quality gear to expand the fleet, encouraging the business to keep heading in a positive direction." "Plus the fleet looks great, and adds to the professionalism of the business." 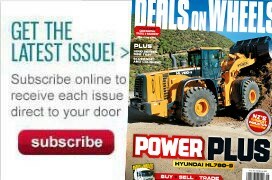 Read the full article in issue #262 of Deals on Wheels magazine. Subscribe here.